As any gamer knows, one of the most important parts of your success in gaming, especially in a first-person shooter, is your mouse. If it’s not responsive, ergonomic, doesn’t slide well across your mouse pad, jumps around on the screen, or doesn’t have enough buttons, chances are it will find its way into the garbage sooner rather than later… or at least your kills to deaths ratio will. I’m sure we have all had our share of below average mice necessitating the move to a more capable unit. But who wants to pay an exorbitant price for a mouse? Not me. 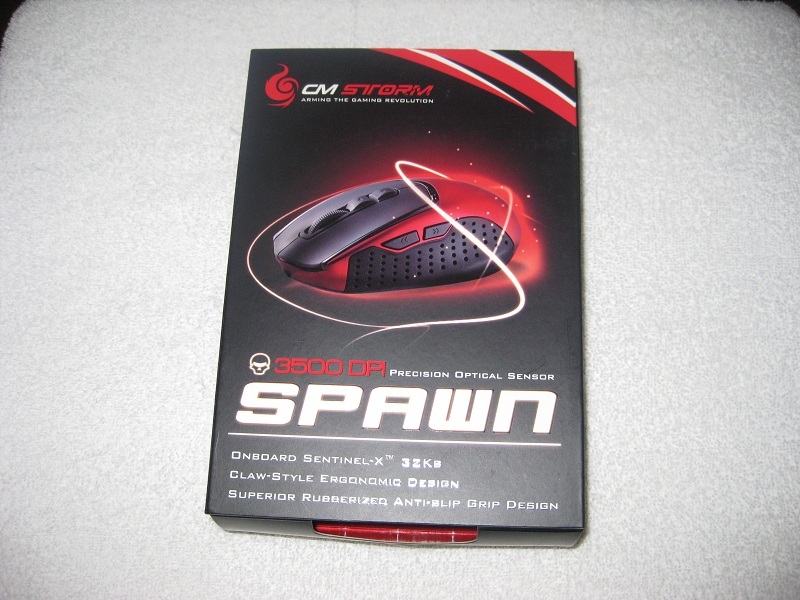 With that in mind, we will be looking at Cooler Master’s new Spawn Gaming Mouse (from the Storm line) which aims to quench a gamers thirst at a very reasonable $49.99 MSRP. 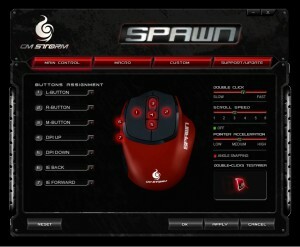 Cooler Master Storm Spawn Gaming Mouse. The unit comes in some nice packaging from the factory. 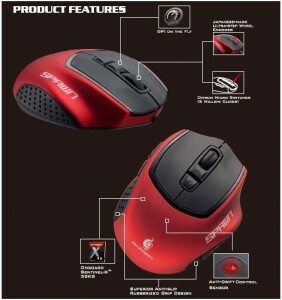 It has a front panel that opens to show off the deep red and black themed mouse. The box panels also list some of its many features. 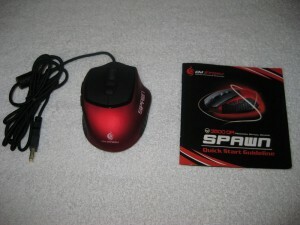 The packaging includes the mouse with 2 m of cable with a gold plated USB connector as well as an instruction manual. 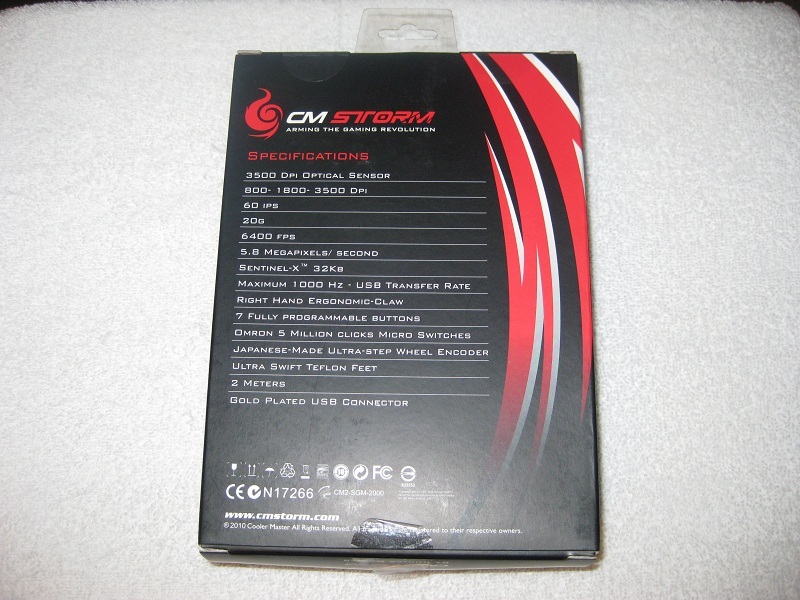 Curiously, a driver disk is missing for the software, but Cooler Master has assured us this will be a part of the retail packaging. 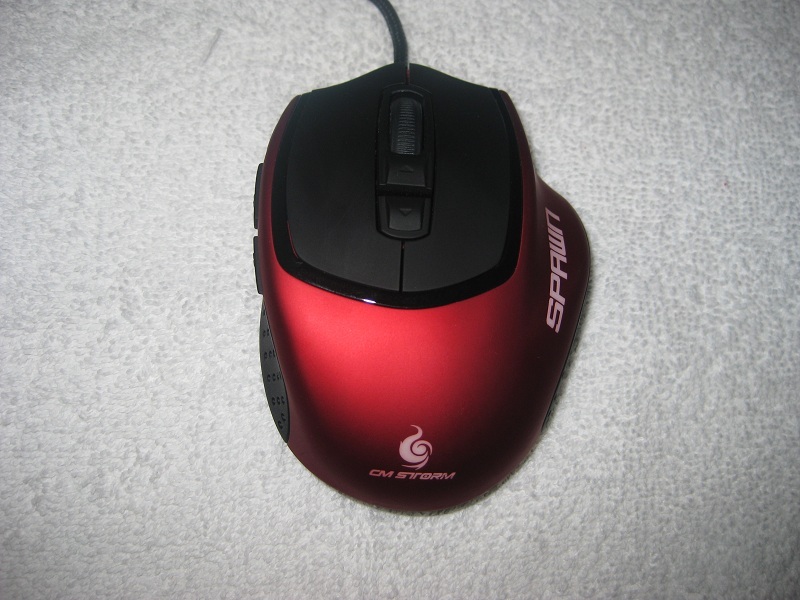 Shown here are some gratuitous closeups of the mouse. 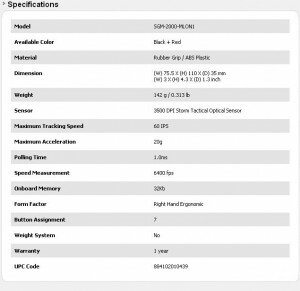 Below is a list of specifications from the Cooler Master site. 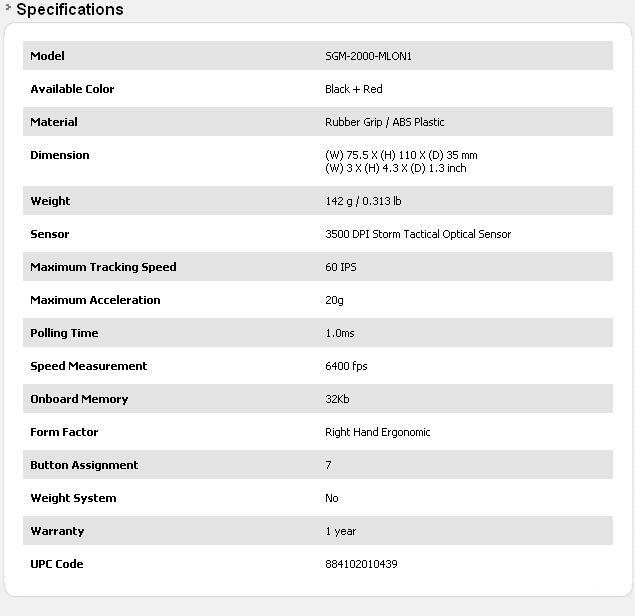 Specifications (Courtesy of Cooler Master website). 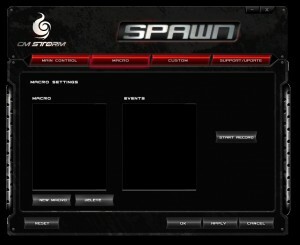 Features (Courtesy of Cooler Master). The Spawn sports features such as on-the-fly DPI changes (up to 3500 DPI and custom programmable), anti-drift control sensors which helps if you run into lift and drop situations with a mouse , the ability to add macros, and a “claw grip” formed chassis. 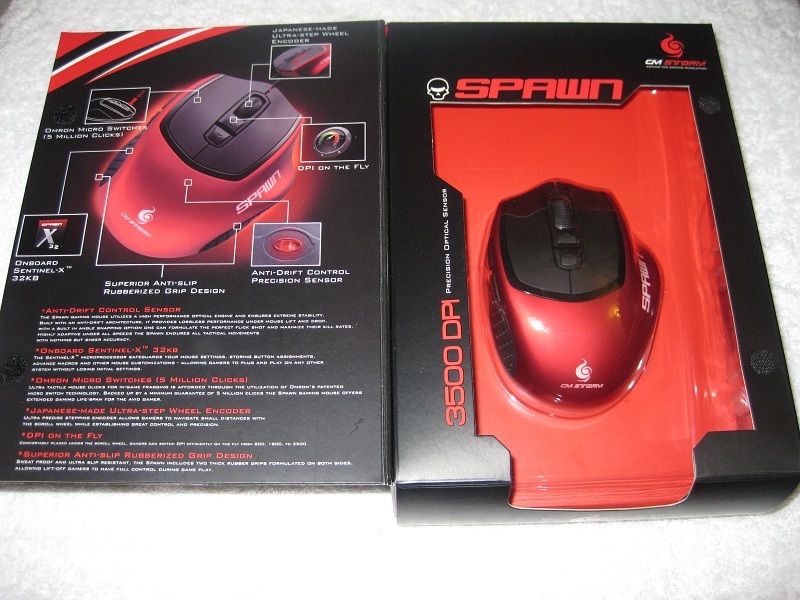 Are you sure this is a budget gaming mouse? Shown below are the screenshots of the software showing off its flexibility of 7 fully programmable buttons, macro creation screens, custom DPI and poling options. Custom DPI and Poling rate screen. Using this software was a breeze. I was able to setup the customizable on-the-fly DPI settings a bit more to my liking and very quickly (I recall them from my current mouse and used those values). 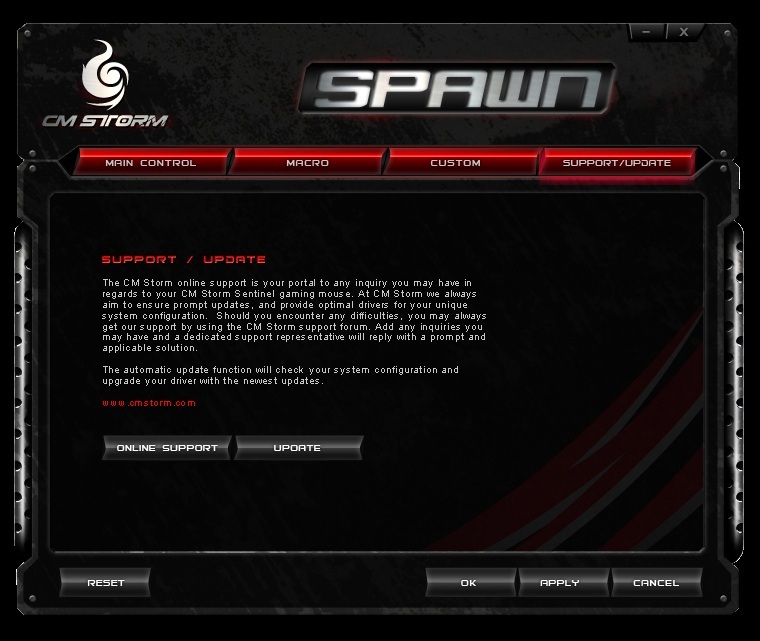 Setting up the buttons was also quite easy. I really don’t have any use for macros, but that page, as all the others, is very straight forward. Now it’s time to see how she performed under fire! Now comes the meat and potatos, the part that everyone wants to know: How did the mouse work? I’m going to just be blunt and throw this out up front. It works very well. After taking a bit of time to adjust to a ‘claw grip’ I found that using this mouse was actually quite comfortable for shorter gaming sessions. In a prolonged gaming session however, a bit over four hours, I found the claw grip may not be for me compared to my standard ‘palm grip’ on my larger mouse. I’m just not a true claw grip type gamer from my limited use of about 12-14 gaming hours over the past week or so. Outside of the gaming arena, I used this as my daily driver and found it to be just as comfortable as my long standing ‘other’ mouse even in prolonged PC use. Once I had my custom DPI’s set up, reaching for these buttons, even with the claw grip, was a breeze. In Battlefield: Bad Company 2, it made switching from the transition of close quarters combat, where quick movements and turning are paramount for success, to moving to a slower DPI, for better accuracy when sniping, much easier. The side buttons, which I have setup in game for melee (farthest forward) and grenades (behind) were just in the right place and seemed more ergonomic than my current mouse. Please note I do have relatively large hands, I can (barely) palm a basketball. With smaller hands, I’m confident these buttons will be in a good place for you as well. The unit is fairly light. 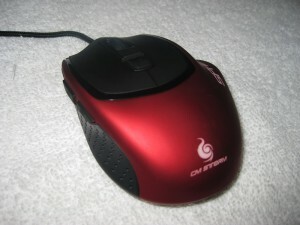 My current, higher cost mouse, came with a tray and several weights for balance and overall feel. While balance on that mouse was never an issue, it was nice to bulk up the unit a bit for my uses. The Cooler Master Storm Spawn doesn’t have this feature and in its price range, rightfully so. So just be aware that it is a light mouse. Contrary to what you may be thinking, this does not affect the build quality as the unit does feel quite solid with no rattles or anything on the test unit. With its Teflon feet, the mouse slid well over my $10 cheapo mouse pad. The tactile response from their Omron Micro switches (CM states they are good for 5 Million clicks) is above average and I preferred that softer yet more telling response the Spawn returned from all buttons than my current peripheral. As I plainly stated in the beginning of this section, the Cooler Master Storm Spawn works very well. It has everything a FPS gamer needs to be successful at their craft, and gamers from most other genres will be satisfied as well. 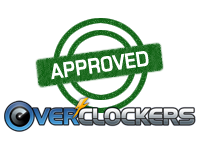 With the pricing listed at a budget conscious MSRP of $49.99, it should be a top consideration for those looking for an inexpensive upgrade. Although it is a light mouse with respect to weight, it certainly isn’t a light weight in features. Having the ability to change DPI on the fly, 7 fully programmable buttons, non slip rubber grips, as well as an attractive chassis, this mouse is a winner in its price class. As of the time of this publication, the mouse is not available anywhere, but look for it in your common e-tailer and brick and mortar stores soon! Well written review EarthDog, great job! You know I'm not much of a gamer as I used to be, but still stuck to my Logitech MX5xx for work/personal use. Awesome! 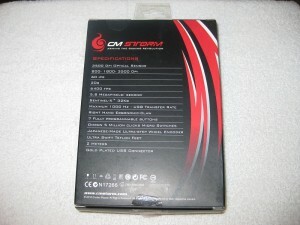 I love my CM case and have been looking for a new mouse. This looks like it may fit the ticket! Iam happy with my G9 , but if I was in need of a mouse I'd probably grab the CM . 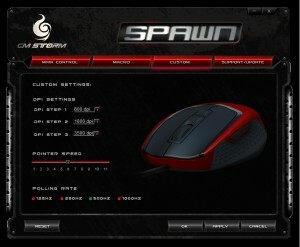 I do like the shape of the mouse and position of the dpi button though . do they offer it for the left handed gamer? No, it only comes in a right hand ergonomic style. Lefties are "left" out in the cold on this one. 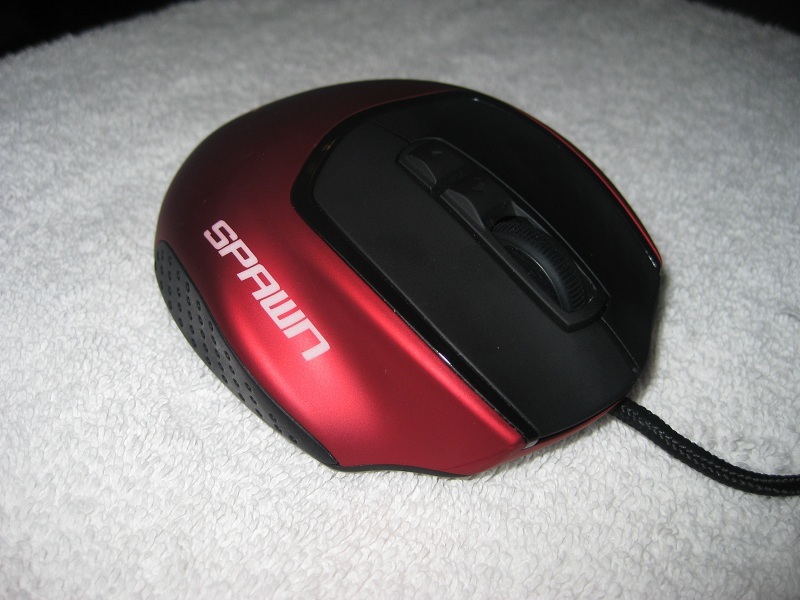 Nice review Earthdog, I think I will stick with my G500, it is just so comfy and logitech's support has been phenomenal.